So many songs are incorrectly interpreted, especially by the BBC who decide to ‘ban’, or ‘restrict’ as they prefer to call it, a song because they think it’s about something it isn’t. Obviously some are and that’s fine, but take for example the Beatles song Happiness Is A Warm Gun which many will say is about a drug injection – a bit like the Lucy in the Sky With Diamonds/LSD debacle which the Beatles have always denied, another is a little known song called Sam Stone by John Prine, unless, of course, you’re a John Prine fan. There is a refrain that says ‘There’s a hole in daddy’s arm, where all the money goes’ leading them to think that, but actually the song is about a Vietnam War veteran. John Prine was born in Maywood, Illinois and has just celebrated his 69th birthday. He learned to play the guitar as a kid after his brother taught him a few chords. Then, after leaving school, took a job as a postman, but wrote and sang songs in his spare time as a hobby. His life and profession changed in 1970 when, after a few beers, some friends talked him into getting up at an open-mic night at a Chicago club called The Fifth Peg. Soon after that he joined the local folk revival circuit and was then discovered by Kris Kristofferson who aided his signing with Atlantic records in the early seventies. 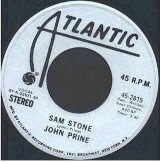 He released his self-titled debut album in 1971 which contained a track called Sam Stone. The song, whose original working title was Great Society Conflict Veteran’s Blues, was written about a drug-addicted veteran with a Purple Heart and his death by overdose. John continued to release albums, the following year came Diamonds in the Rough which contained a song called The Great Compromise which was also about the Vietnam War. Then came Sweet Revenge (1973), Common Sense (1975), Bruised Orange (1978) and Pink Cadillac (1979). The only one to breach the US album chart was Common Sense which reached number 66. Between 1980 and 2000 he released a further 11 albums which all received critical acclaim but didn’t translate into sales and thus failed to chart. During 1983, Pink Floyd were recording their album The Final Cut and Roger Waters was inspired by Sam Stone so much that he used the melody in the song that open the album, The Post War Dream. There is another act who were inspired and that was the psychedelic rock band Spiritualized where the final track on their 1997 album Ladies and Gentlemen We Are Floating in Space, Cop Shoot Cop…, uses the almost identical lyrics ‘There’s a hole in my arm where all the money goes, Jesus Christ died for nothing, I suppose’. In 1998 John was diagnosed with a rare skin cancer called Squamous-cell carcinoma on his neck. He underwent major surgery followed by a month and a half of radiation therapy that left him with a more gravelly tone to his voice. Radio Two’s Bob Harris is a big John Prine fan and has championed his music for years. In 2003 John received a Lifetime Achievement Award for songwriting by Radio Two. His good fortune continued when later the same year he was inducted into the Nashville Songwriters Hall of Fame. In 2005, after a five year hiatus, his record label, Oh Boy, released his latest album called Fair & Square which, to date, has given him his highest US chart placing when it reached number 55. In November 2013, John’s health became an issue again and he left a message on his website which said that he will undergo surgery. It involved cancelling some concerts but, as John said, “Doctors found the cancer early and they see no reason why I won’t fully recover. It was a different type of cancer from what he had 15 years earlier. John made a full recovery and was back touring. In August 2015 he announced a stack of tour dates for this month, but, if you want to see him, you’ll have to go the US where he’ll be in Alabama and Florida some of which will be with Kris Kristofferson.